It seems like the release of the next generation tablets from Samsung has been delayed from March end to April end as reported by Samsung spokesman. It is interesting to know that the cause of the delay has been cited as the company needs more time to access to Ice Cream Sandwich; however Samsung had access to Ice Cream Sandwich longer than any other manufacturer. Samsung was the first to release the Google’s Android 4.0 with the Galaxy Nexus on board in October. Other OEM’s gained access to Ice Cream Sandwich only in November that is about a month after Samsung received the codes. 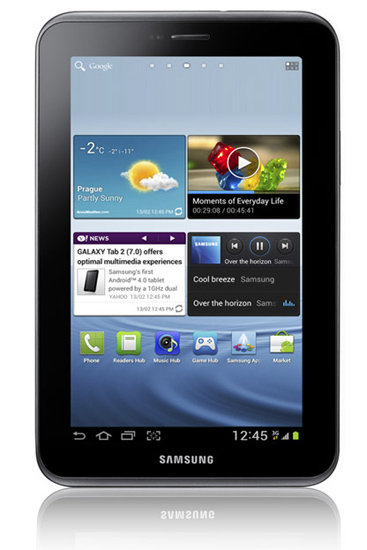 The Galaxy tab 2, which includes both the 7inch as well as the 10.1 inch variant, will be the first tablets to ship from Samsung with Android 4.0 on board. The two tabs will be powered by dual-core 1-GHz processors accompanied by 1 GB of RAM. These tablets will support worldwide 3G data, with HSPA+ at 21 Mbps in the 850/900/1900/2100 MHz bands. In Addition to that 802.11b/g/n Wi-Fi, GPS, USB 3.0, Bluetooth 3.0 and a bevy of sensors are also equipped with these models. The tab with 7.0inch screen is capable of displaying 1024 x 600 pixels of resolution, while the 10.1 inch model will be supporting 1280 x 800 pixels of resolution. Both of these models will be equipped with a 3 megapixel fixed focus camera to their rear along with a VGA camera to their front. These cameras will be capable of recording HD video at 1080p resolution at 30 frames per second. In general the models will have storage of 8GB, 16GB and 32GB and will also include a 32GB MicroSD card slot for external storage. These tablets will also be a bit slimmer from the original models as well as a bit lighter too. However an important point to be noted is that they lack 4G support of any kind, along with that the cameras are also of low quality. There has not been much change in terms of memory set ups as well. Let’s see how they will perform in the market after they get released.